Can we weather another economic slowdown? The struggling economy around the world is being noticed here in the U.S. as measured manufacturing output is falling again — LINK. (see graphic below) I’ve been hoping for a recovery from the recession, but this news this is not at all promising for jobs or a rebounding economy. 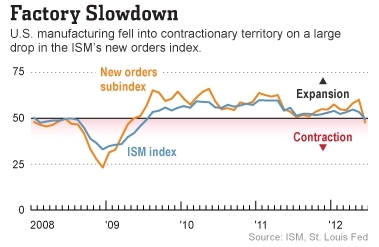 Can the U.S. avoid a double-dip recession? The global slowdown is hitting U.S. manufacturers hard, threatening a key pillar of the recovery and fueling fears the economy is heading for a stall for the third year in a row. New figures Monday provided the latest proof that Europe’s debt and banking woes and disappointing growth in China and around the globe are crimping activity in the U.S. manufacturing sector, which has been a big driver of the economic recovery that began in mid-2009. Other reports have suggested U.S. exports were much weaker than originally thought earlier this year and that corporate profits from abroad are now shrinking instead of growing.